There is a lot of misunderstanding about the diaphragm in voice work. The diaphragm is a smooth, concave muscle like a dome that separates the abdominal cavity from the respiratory cavity. The top of the dome of the diaphragm sits at about breast level and then it slopes downward all the way round the respiratory cavity to line the six lower ribs of the ribcage and attach in the back to the thoracic spine. It does not come out of the rib cage! Let me repeat that, it does not come out of the ribcage. All of the sensations you feel are it’s action on the rest of the body. The strongest sensations are within the abdominal region, waist area and the bottom of the rib cage. Many choral directors have pointed to the abdominal region and said, “Breathe from the diaphragm,” but the diaphragm is not in the belly. Every time you breathe a nerve in the cervical spine sends a message to the diaphragm to lower like a pump. 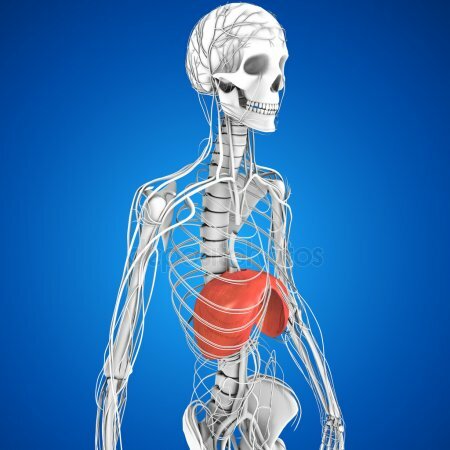 The lungs are attached to the diaphragm by a pleural membrane, so the lungs are stretched open as the diaphragm descends creating a desire for the body to inhale. When you inhale the diaphragm descends moving everything below it out of its way. It is most important to relax the abdominal area on inhalation so that the diaphragm can lower fully. Right now pull your belly in and try to breathe deeply. You will feel that the muscle engagements in the core make it impossible to do so. Each person will have different sensations on inhalation within his or her body due to the individual shape of each person. A tall person with a long torso will probably feel the affects of the diaphragm closer up toward the bottom of his or her ribcage where as a short person with a short torso will feel a lot of expansion deep with in his or her body. So there is not a “one sensation fits all” for breathing. We all are unique and we will all breathe a bit differently.